To all the adults who have their careers figured out (or, at least, mostly figured out), did you go through a period of major conflict in deciding on a career? Please say yes. Please say yes. Please say yes. I am in that situation as we speak. Registered Dietitian/part-time blogger vs. Food Writer/part-time blogger is my current toss-up. UGH. The latter was my dream for about two years at the beginning of college, which I spent as a Journalism major. Telling people how to/what to eat in such a strict manner, which I thought would be my main role as an RD, really turned me off to the career. Plus, I just LOVE writing and I love food and I love writing about food (hence, the blog). The former has only recently come about as I've switched my major to Nutrition. There came a time in my studies of Journalism when I just couldn't stand the classes anymore and found within myself a HUGE passion for nutrition (specifically veganism, at the time), so I switched. I dove head first into chemistry and biology and Nutrition classes and loved every minute. For a while, I wanted to continue my pursuit of food-writing, but as I immersed myself more and more in my Nutrition studies, and as God made me more aware of the need for RD's who don't promote fleeting, unsustainable diets, I couldn't ignore His voice (obviously). Now, I feel like I'm bouncing back and forth between the two careers, unable to settle on just one because each comes with pros and cons and I can't seem to figure things out. As an RD, I'd imagine more opportunity to make a stronger impact on lives and help stimulate much-needed change in diet culture (or maybe elimination is a better word than change here). As a food-writer, I'd imagine more opportunity to chase the heck after my passion - food + writing - and maybe, just maybe, write for my dream magazine, Bon Appetit. Here, I'd make my impact by showing others that food. is. to. be. enjoyed. Every food is special and worthy and unique and that is b-e-a-utiful. As I articulate these thoughts through the process of writing - one of the main reasons I love it and do it so often - I realize that the careers intersect in a way I didn't see before. Both promote a fearless love of food and self, which is the theme of what God's been teaching me in the years of healing from my past relationship with food. It is important, however, to mention that an RD certification would require at least one year of a paid internship (meaning I pay and don't get paid) and possibly two years of grad school. To be a food-writer would only require endless amounts of time spent in the community, making connections with newspapers and other writers, + here on the blog, continuing and improving what I do now. So, I know my next few steps. I know I need to finish my undergrad, which I will finish with a BA in Nutrition. I know I need to spend a year working and saving money, which might be done as a waitress or a donut-slinger at my favorite shop or a diet aide at the hospital or a full-time nanny. From there, God only knows! Combine the coffee and water in an airtight container (mason jar worked perfectly), stir, and let sit for at least 12 hours. I used an Ellie's Best nut milk bag to filter it, which you can view here. I've also heard that cheese cloths work. Strain the coffee beans (any suggestions for uses? I hate throwing them all away!) 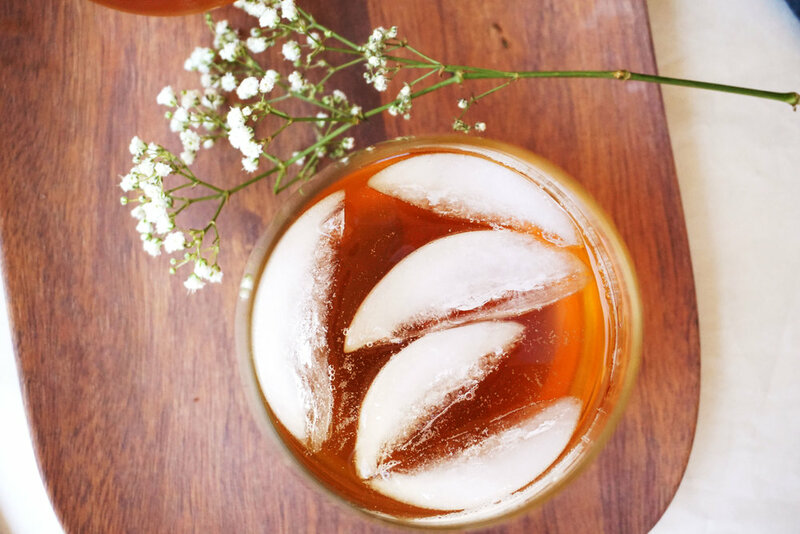 and pour the cold brew back into a pitcher or back into the rinsed mason jar. Store in the fridge for up to six months. Serve with a touch more water, plus some ice and creamer, if desired. Use "hungryhaley" for your Purity Coffee purchase and "hungryhaley10" for your Ellie's Best purchase! Remember that one time I made cinnamon rolls? You saw snapshots of the process and photos of the finished product, but you didn't see the entire thing from start to finish. If you had, you'd have a 3823751 times better understanding of just how excited food gets me. It was the same exact thing with this lemonade. My dad saw it all, and kept wondering, "Haley, it's just lemonade. What's the big deal?" DAD IT'S HOMEMADE AND IT'S GOOD. There's just something about doing it all yourself, whether it be cinnamon rolls or crackers or strawberry lemonade or vegan cheese. And there's a little extra something to discovering that a DUH-licious homemade version of some of your childhood favorites actually exists and works, you know? When I made lemonade as a kid, perhaps to sell to generous neighbors in hopes of raising maybe $2-3 to buy ice cream from the ice cream truck later in the sweltering summer afternoon, there were no fresh lemons involved. The only preparation included stirring the powdered lemon + sugar flavoring into a pitcher of water, tossing in some ice cubes, and calling it a day. Remember that? The same thing went for cinnamon rolls. Crack that Pillsbury can open, cut the rolls and spread them out on a pan to bake for 30-40 minutes, top with the canned icing, and boom - done and done. Of course, I'm holding nothing against good ol' Pillsbury doughboy, buuuuuuut... there's nothing I would love more in this moment than to invite the cute, giggly little fluff-ball over for some freshly baked vegan cinnamon rolls with a light coconut cream icing. Don't worry - you can come, too! The HungryHaley who had no idea the non-diet mentality + Intuitive Eating + all-foods-count concept existed would've demonized these packaged foods. Heck, she probably wouldn't even have made this lemonade because of the sugar required *eye roll*. BUUUUUT the new and happily, healthfully improved HungryHaley will not label any food - sugar-free or sugar-rich, vegan or non-vegan, packaged or whole - as "bad" or "off-limits". Every food has its time, its place, and its calling (even the powdered lemonade mix and the Pillsbury cinnamon rolls). BUUUUUT (can you tell I enjoy capital and repeating letters for emphasis?) let me bring myself back to magical satisfaction that is homemade favorites. 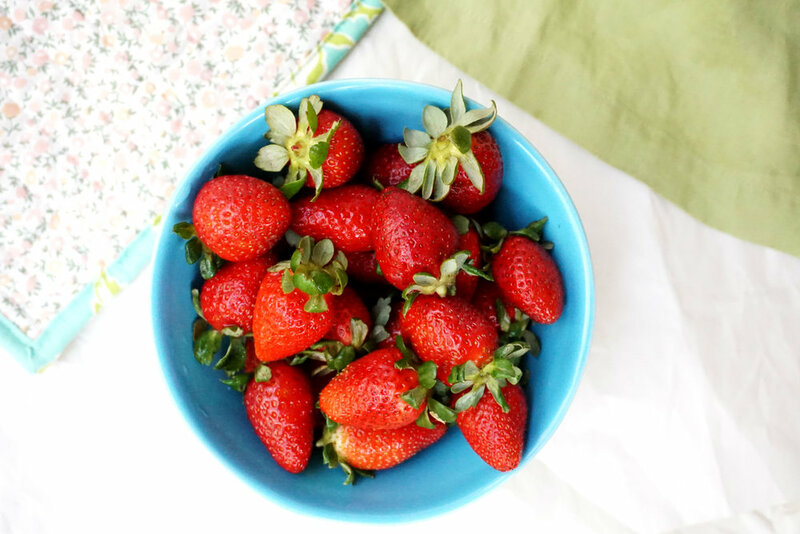 I picked up fresh strawberries from the local strawberry stand - it's a popular thing where I live in OC - on Saturday morning for this recipe. Maggie (my lil' pup) and I pulled up to the stand on the side of the road and one thing caught my eye immediately. It wasn't the berries red as jewels, or the dates sweet enough for caramel, or even the competitive prices. It was the man leaning up against his pick-up truck, munching on some of those little red jewels. His body language and the contentment on his face said, "I have nowhere else to be. I love this place. I love this moment. 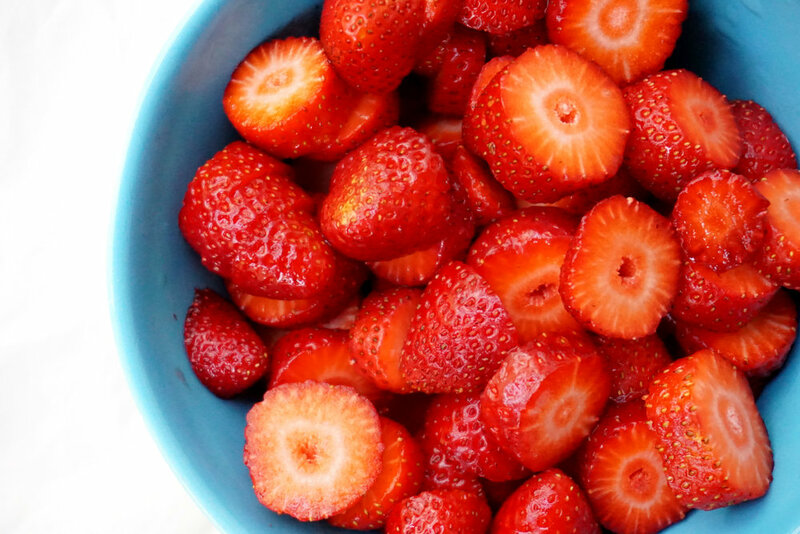 I love these berries. I grew them, and I'm so ready for you (me and the pup) to enjoy them, too." A small, easy-to-miss moment if I had been in a hurry or on my phone. Thank God neither of those were the case. Now, I wish I could invite the Pillsbury doughboy AND that welcoming strawberry-loving farmer over for a celebration of summer, Saturday, and a simple, innocent love for community and food. 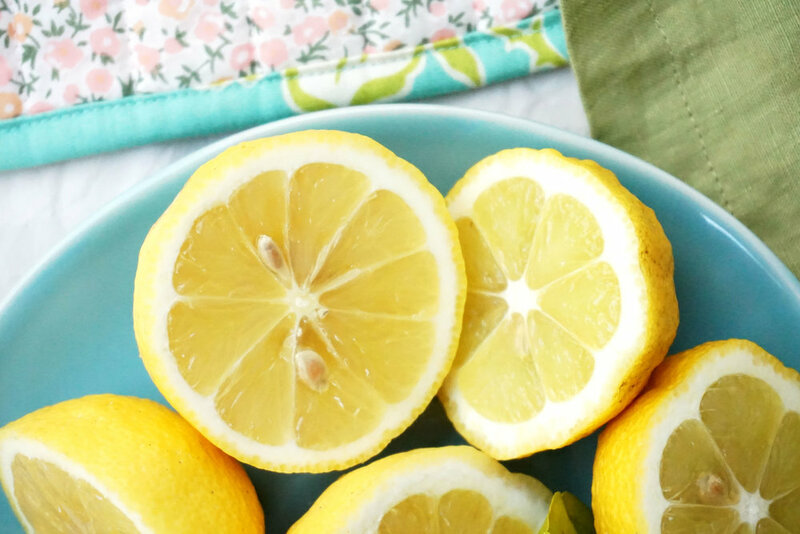 Stir together the lemon juice, cane sugar, and boiling water in a heat-safe pitcher. Next stir in the filtered water and refrigerate until cool. If using the suggested flavor infuser + pitcher, place sliced strawberries into the infuser and pour the cooled lemonade into the pitcher. Screw the infuser in tight and close with the lid. 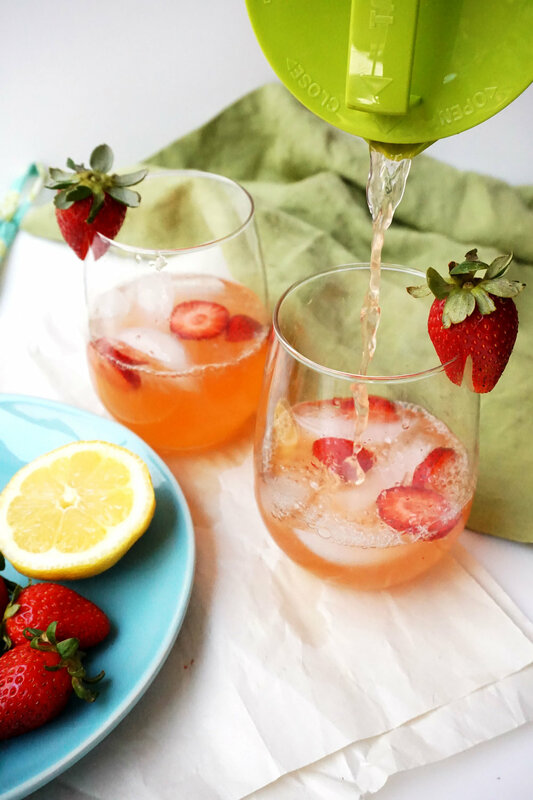 Fill glasses with ice cubes and extra sliced strawberries, and pour in the lemonade. Use the code "HALEY10" at checkout for 10% off your Ellie's Best order! Step 2: squeeze another pecan, and repeat squeeze-process until enough milk is obtained. Okay, I'm kidding. But I did have to make that joke because Dad thought it was absolutely hilarious when he attempted to squeeze a pecan to make some fun of my dairy-free milk. I thought it was funny, too, Dad. You win. Speaking of, have you heard of the dairy vs nondairy milk debate going on? My nutrition professor brought it up in class this week and I would love to hear your thoughts! Never did I ever think I'd come so far in life as to whip up my own homemade nut milk on a bi-weekly basis. Fifteen years ago, I was writing "Slim Jim's" on my Christmas lists as my brother and I sucked down Mom's homemade oreo milkshakes (loaded with real-life oreos and non-vegan ice cream). My comfort foods during the winter months were Dad's leftover-ham mac n' cheese and "skinny noodles" (aka just packages of Ramen) with a side of salami and crackers topped with butter. If you need some motivation, there it is. Where the heck would I be now, had I continued to consume at least one Slim Jim per day, not to mention the nachos (that canned, shelf-stable "cheese" sauce gives me nightmares) I just had to have at my brother's basketball games, and the no-stir, definitely-not-natural, barely-even-peanutty peanut butter, name a few. Alas, here I am. Cooking my own beans every week (I used to hate beans), drinking coffee at least once a day (used to hate that, too), blending kale and sometimes even cauliflower in my morning smoothie (but aren't veggies a dinner-only food? no), and soaking nuts for homemade nut milk on a bi-weekly basis. What a transformation. What a life I live. Still need a few more reasons to make the switch to homemade nut milks? Doing so can reduce the sugar content (many store-bought brands add sugar). Homemade nut milk = leftover pulp (i.e. almond meal for baking, and pecan meal is a thing, too, by the way). Doesn't pretty much everything homemade just taste 10x better than the other guy? Use "HALEY10" for a discount on your new Ellie's Best reusable nut milk bags! Soak 1 cup pecans in 6 cups water for at least 8 hours, or overnight. Blend (with any other optional add-ins) and strain, using Ellie's Best bag, into an airtight container/bottle and refrigerate. Spread pecan meal onto a baking sheet and dehydrate at 350F for 10-15 minutes, or until golden and crispy. Store pecan meal in an airtight container for up to one month.